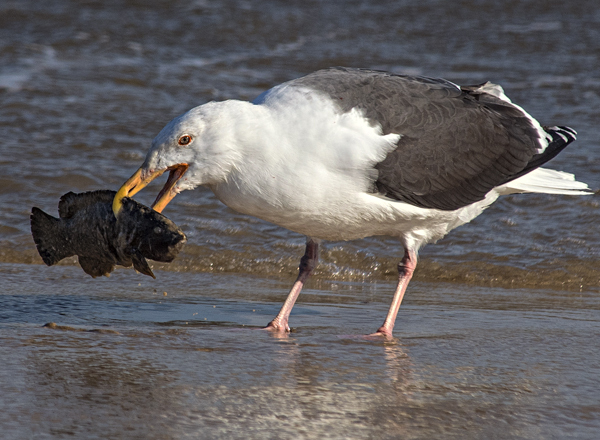 What do you do if you are a lucky gull that happens upon a nutritious but frozen stiff dead fish on the beach in bone chilling cold? Well I watched this one take its find into the shallow water along the beach and repeatedly throw it down and pick it up until it softened sufficiently to be enjoyed. Pretty crafty huh? 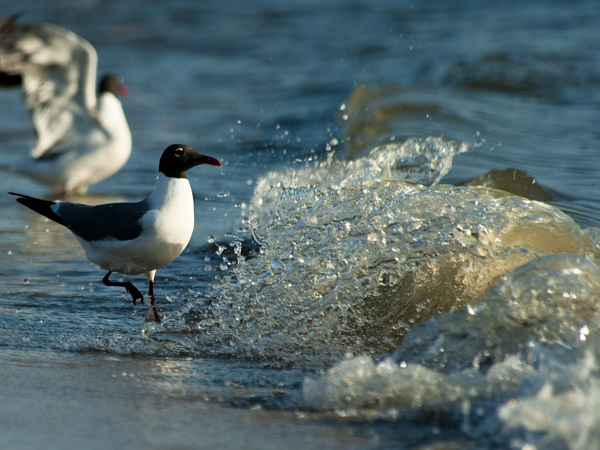 I’m grateful for the show and getting a nice photograph of the lucky, smart gull. 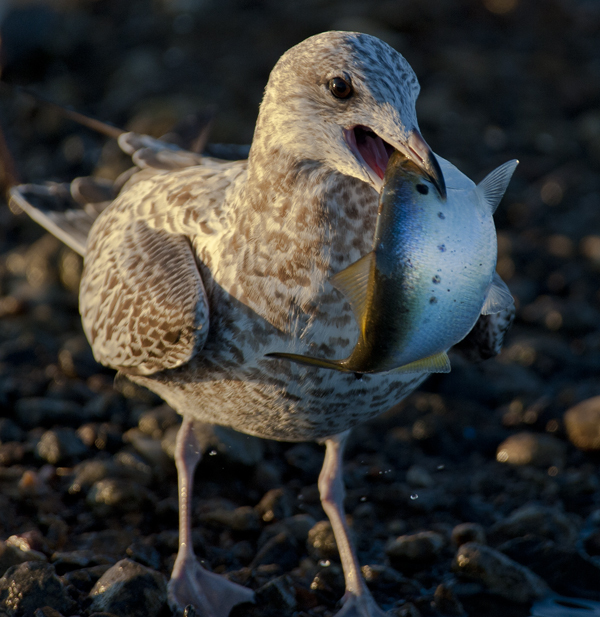 This young gull has a fishing lure hooked through its bill and monofilament line over its back and around its legs. I saw it at IR Inlet yesterday just before sunset and a few minutes later it was gone. The poor bird was in obvious pain. Fooled by the lure it now is severely hindered in its ability to survive winter days on the beach. 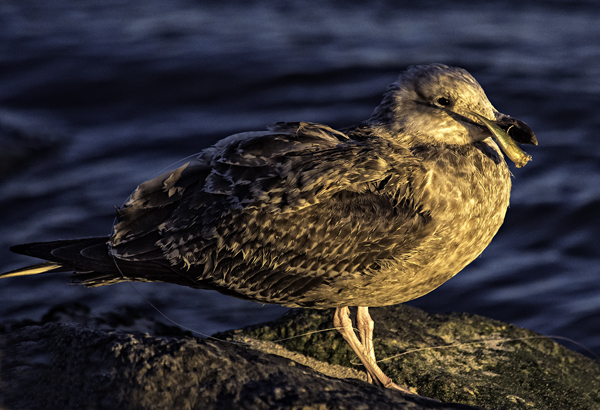 Fisherman often snag their lines on the rocks as they fish in the inlet and it is likely that this bird saw what it thought was a tasty treat but now has a life threatening injury. Survival in nature is tough enough but this sad sight is a reminder that for so many animals debris in the marine environment can make it that much tougher. 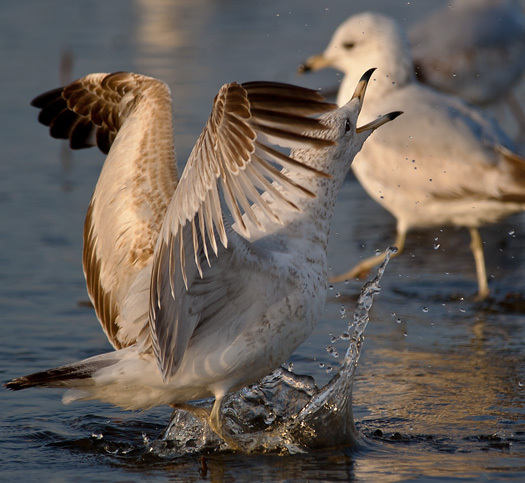 Dozens of gulls massed on a school of fish in a Delaware marsh pond but only a few gulls came up lucky. This one was the envy of its neighbors as it took off to fill its belly. 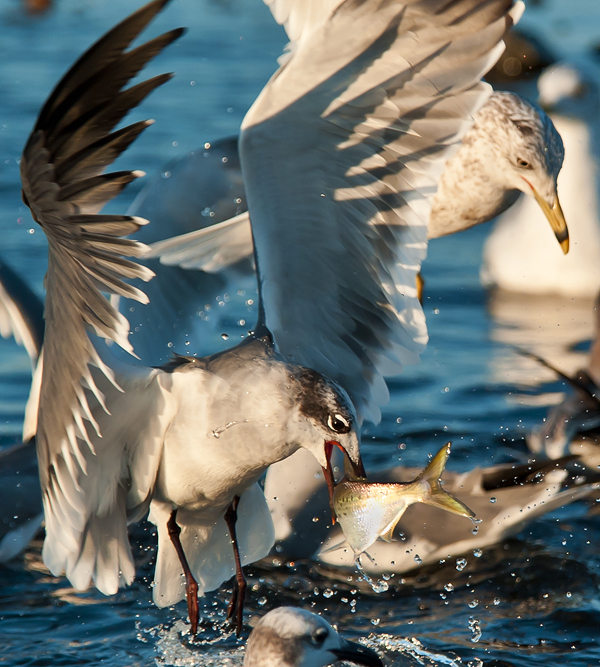 This lucky gull plucked a nice catch out of a tidal pond at Prime Hook National Wildlife Refuge this morning. 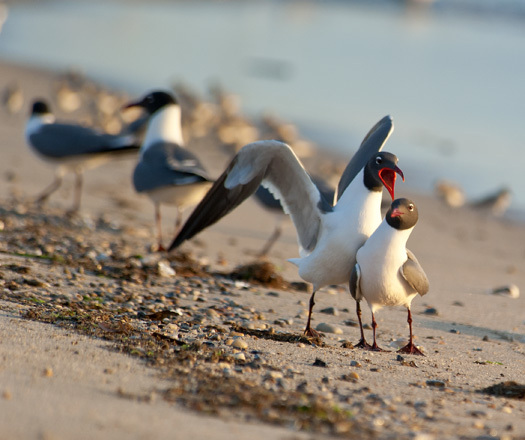 Laughing Gulls were at the party Sunday morning working the tidal wrack line on the beach at dawn in search of newly washed up breakfast tid bits. The pastoral scene was not, however, without some strife as demonstrated by this alpha laugher chest checking a colleague. The recipient of the bellowing is slightly deafened but moved right on to the next course. 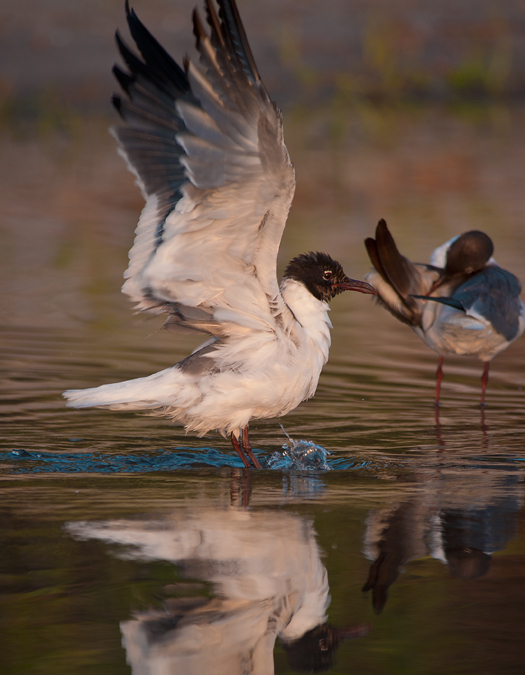 Or, Laughing Gull stretching. A nice reflection in any case. 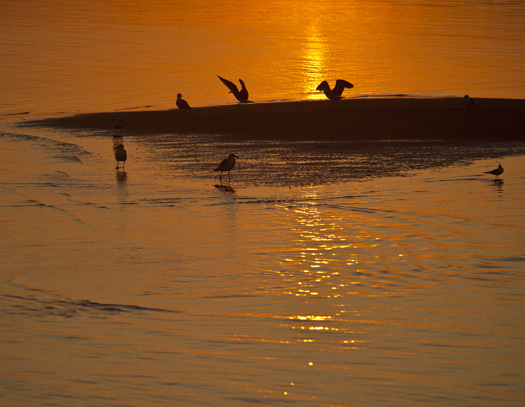 Gulls sociallizing on a bar at sunrise. 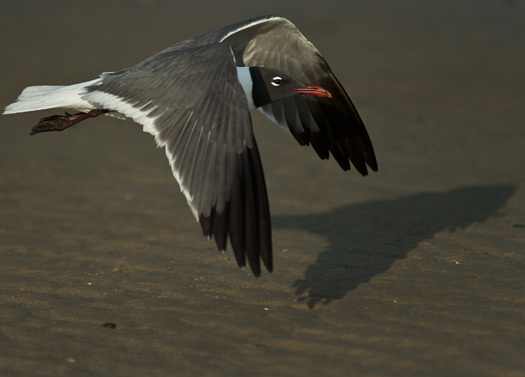 A Laughing Gull takes off down a sand bar runway.